The character of Oliver the Great Western engine first appeared in book No23 of the’ Railway’ Series, ‘Enterprising Engines’, published in 1968. The following year would see him feature in his own book (No24 ‘Oliver The Western Engine’). Oliver entered the television series during series 3 (1991-1992), in the adaptation of his debut story from the ‘Railway’ Series, entitled ‘Escape’. 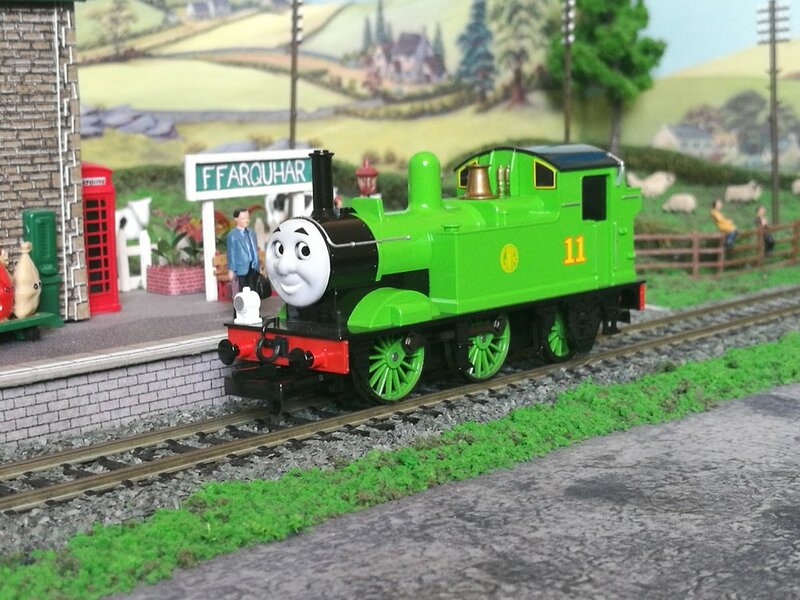 With the recent, much-anticipated release of Oliver into the popular Bachmann 'Thomas & Friends' range, a review of this model is certainly in order. However I'm going to do something different from my usual product reviews and this time compare the Bachmann Oliver to Hornby's model of the same character, which was released back in 2004. Through the next 5 sections of the review I shall be looking at both Olivers, highlighting their pros and cons. A point will be awarded in each section to whichever of the two models earns it. In the event of a tie, a draw will be declared and neither model will receive the point. Before we continue I should point out that all thoughts and opinions expressed in this review are entirely mine and mine alone. Anyone else who owns both of these models may reach different conclusions to me and that's perfectly fine. Everyone is entitled to have their opinion, all I ask is that you please keep it civilised. In this case the point has to go to the Hornby model. The box is easy to open and provides adequate protection for the contents. The Bachmann packing requires either scissors or a sharp knife to open it and even then it can be troublesome. After 15 years I really think Bachmann should consider a re-design of the packaging for their HO scale 'Thomas' items. The Hornby Oliver is made using the ex- Dapol tooling of the GWR 14XX class and, for an old toolin,g it features a huge amount of detail both moulded and separately fitted. Although there's no cab detail, the open cab allows for the addition of a footplate crew, obscuring the lack of cab fittings. 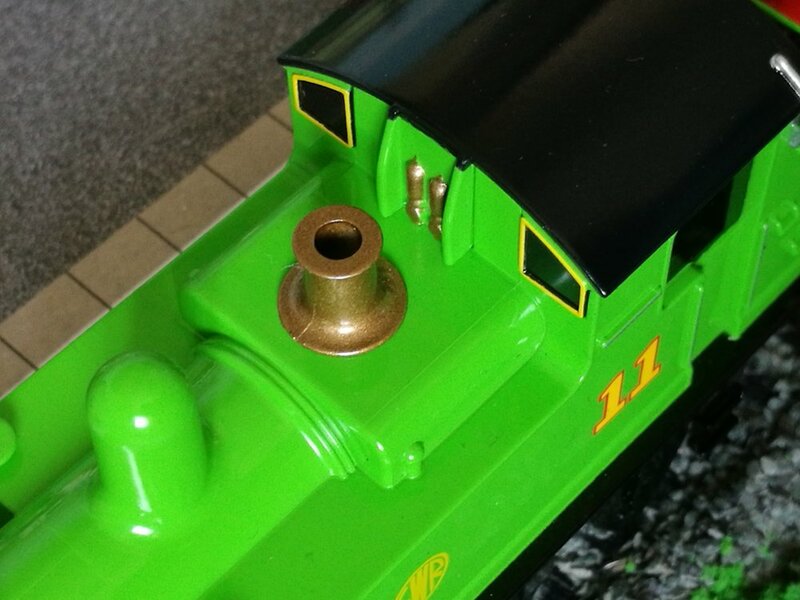 One unfortunate problem is the handrail over Oliver's face, which has been attached into his forehead, making it look like he has a facial piercing. Moving to the Bachmann Oliver, the model has been produced using the CGI rendering of the character created by ARC Productions (the show's animators from series 17-20). As is traditional with all the other tank engines and diesel shunters in the Bachmann HO scale 'Thomas' range, Oliver's cab is enclosed, so a crew is impossible to fit. Strangely, the counter weights on the drive wheels seem to be missing too. 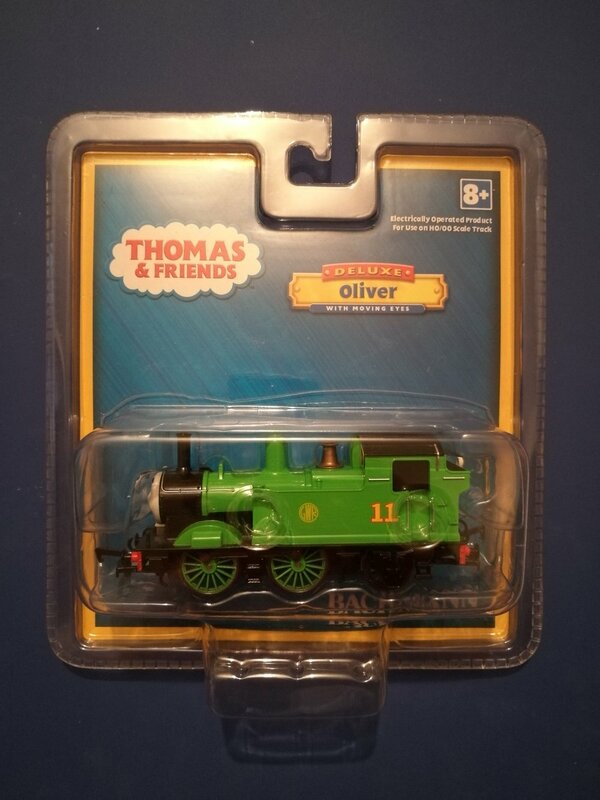 At first I thought that this was a factory error, however watching some recent episodes of 'Thomas & Friends' that feature Oliver has revealed that ARC didn't add them to the wheels either. 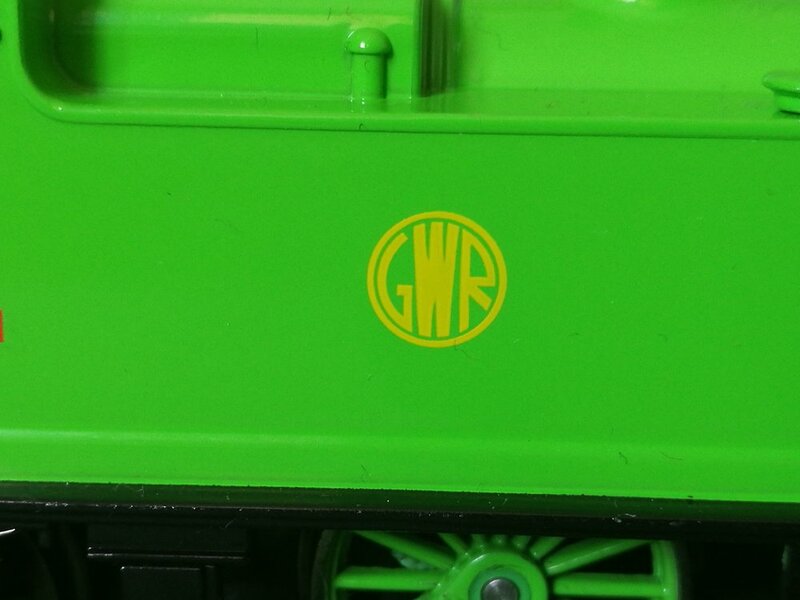 Bachmann have simply copied the CGI rendering and in doing so they have also copied this little mistake. For this category the point has to go to the Hornby model again. It's the more accurate representation of a 14XX class of the two and is bristling with moulded and separately fitted details, the only hiccups being the lack of cab fittings and the facial piercing. Although the Bachmann model is accurate to the CGI rendering in the T.V series it is inaccurate when compared to the characters real life basis as ARC never used it to create their computer model. 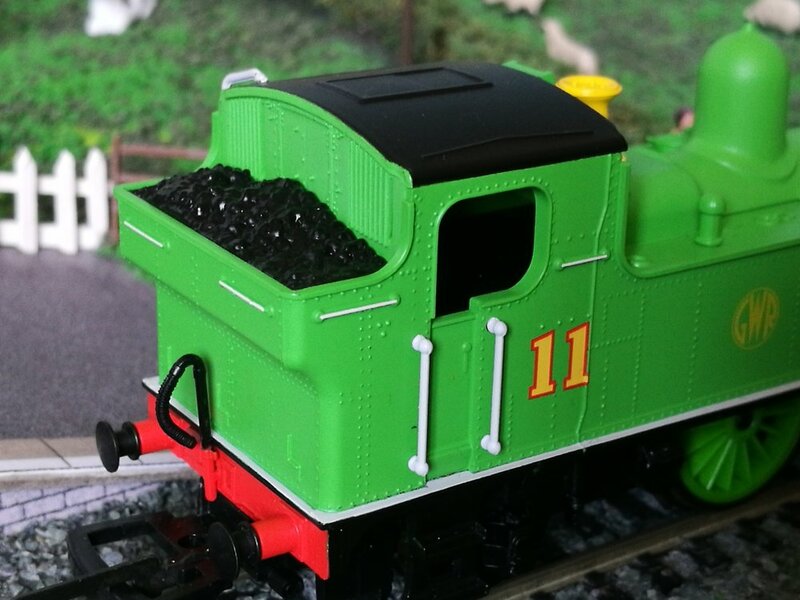 Both Olivers are painted in the correct bright green livery, the Hornby version being finished in matt whilst the Bachmann counterpart is finished in gloss. 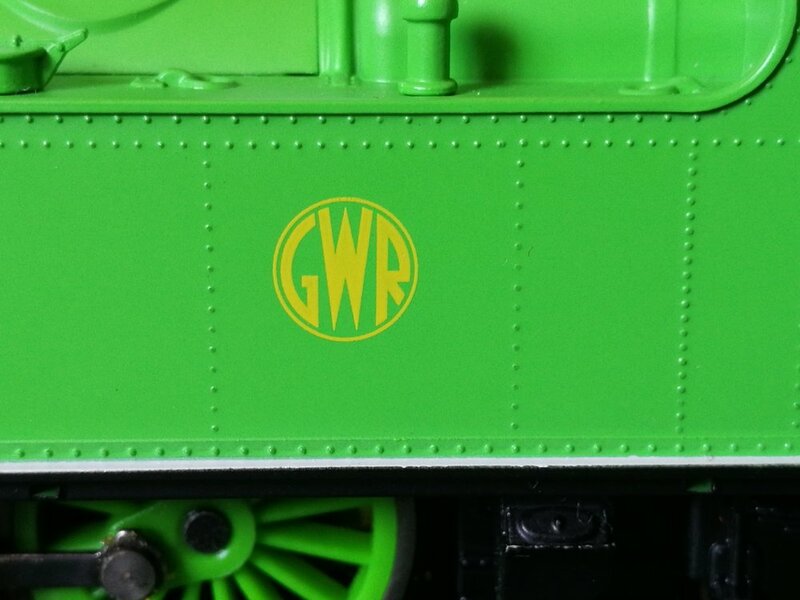 As far as printed decals go, they both feature correctly fonted GWR shirt button logos and running numbers. There is one noticeable difference that sets the two models apart however: the Bachmann Oliver's whistle valves and safety valve bonnet are painted in a realistic copper colour whereas the ones on the Hornby Oliver have been painted in an incorrect bright yellow. So, on that note, the point for this category goes to the Bachmann model. The Hornby Oliver unfortunately has nothing in the way of special features, unlike the Bachmann model which features the infamous moving eye mechanism that is seen on all of the HO and G scale 'Thomas' locomotives from Bachmann. For me, this fantastic gimmick really brings the models to life when they are in motion. So the point in this category rightfully goes to Bachmann Oliver. The tests were performed on a basic oval of Hornby track which sat on a firm and flat surface. The two models were given a light oiling and had their wheels cleaned to give them the best chance, even the coaches used in the haulage test (a rake of 6 Bachmann 'Thomas' red ‘ Branchline’ coaches) were oiled to make sure they were as free-running as possible. Both Olivers performed smoothly and steady in the 'light' engine test. This came as no surprise as they both benefited from powerful motors and electric pick-ups on all their wheels. In the end the Bachmann Oliver won as it was the quieter of the two. In the haulage test, the Hornby Oliver won buffers down by handling all 6 coaches with ease. It's traction tyres and heavier body making it no contest. That's not to say that the Bachmann Oliver failed however: despite being lighter with no traction tyres, it still managed to pull all 6 coaches, albeit with fiercely slipping wheels. So, it ends in a tie at two points apiece. Throughout this review I've done my utmost to be fair and in the end both models have proved themselves to be just as good and worthy as the other. So which is the better model? Hornby or Bachmann? In the past this question has caused heated debates among 'Thomas' collectors on the forums. Both ranges have their advantages and disadvantages. For the most part, the Hornby 'Thomas' range portrays the characters as they would appear in the real world however the number of engines on offer at the time of writing this review is very minimal. The Bachmann 'Thomas' range features the characters as they are seen in the television series and incorporates the moving-eye mechanism. But some of the models are limited in how much they can haul due to their light weight. In the end it all boils down to this: as with most things in life it's all down to individual choice and preference. If you want to portray the NWR (North Western Railway) as it would be in real life then go with Hornby. If you wish to imitate the T.V series then go with Bachmann.